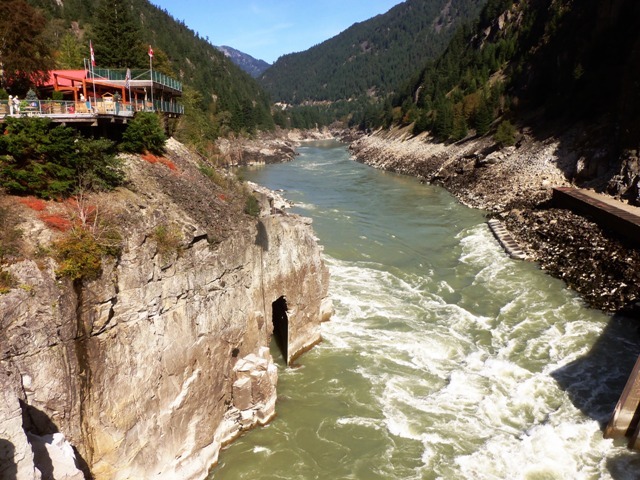 Deep in the heart of the Coastal Mountains of British Columbia is a rugged and picturesque 38 kilometer (24 miles) long canyon that carries Canada’s third largest waterway known as the Fraser River. For over 300 years the Canyon’s great walls have seen the early explorers, fur-trappers, Native Indians, gold prospectors and settlers searching for new lands. 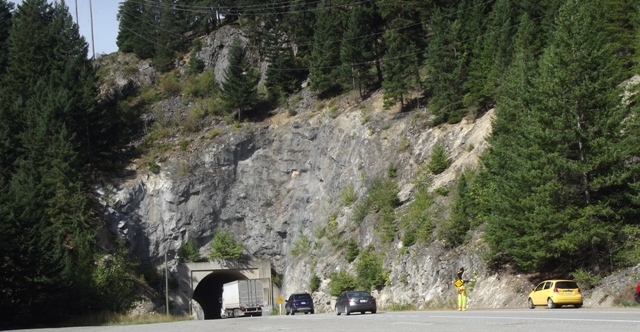 When roads were cut into its walls and slopes it became for many years the Cariboo Wagon Road and later when tunnels and sturdier roads replaced the cliff-hanging parts it became a spectacular section of the great Trans Canada Highway. That opened up a scenic attraction for visitors from all over the world. Two great railroads – the Canadian National and the Canadian Pacific were cut and blasted through the canyon, linking the East Coast and the Prairies with the Pacific Coast. When the Fraser peaks in late May and June, it can produce flows topping 10,000 cubic meters a second -- that's over two million Imperial gallons a second. Every so often floods triggered by fast melts of winter snows up country, tear out bridges and create havoc. The narrowest point in the Canyon is known as Hell’s Gate. The actual gorge is 300 meters (990 feet) and it narrows to a mere 34 meters (112 feet). Water churns through this gorge at speeds of up nine meters (30 feet) per second. 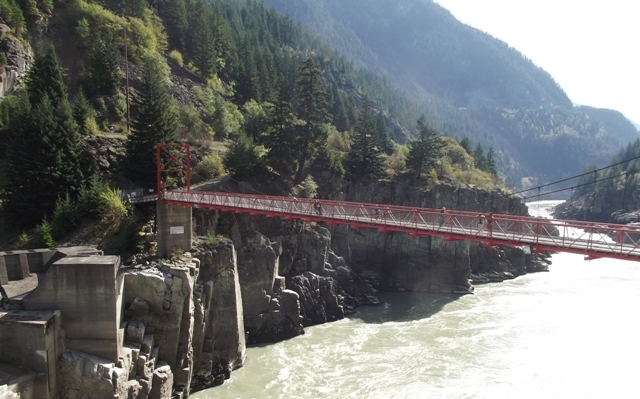 The history of the Fraser Canyon shows it is not the safest or the kindest place on Earth. Beautiful places often claim lives, and such is the story of the salmon who for time immemorial braved the Fraser River to spawn new generations in the pastoral streams of the Interior such as the Adams River. In 1912-1913 during construction of the Canadian Northern Railway (it was later called Canadian National) tragedy struck. 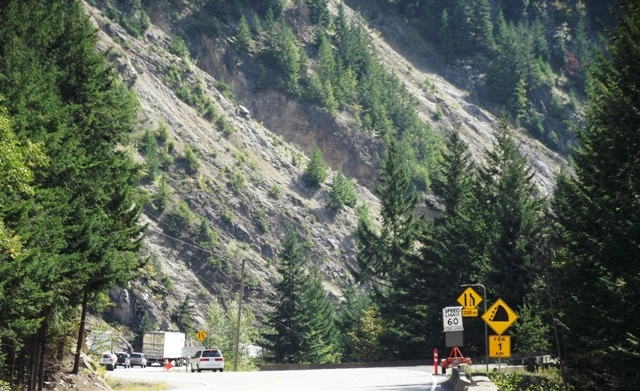 Blasting triggered half a million tons of rock to plummet into the Fraser. If that was not enough in 1914 a huge rock and masses of debris crashed into the river creating blockages and disaster for spawning salmon. A recorded catch of 31 million fish in 1913 dropped to a mere 1.8 million by 1921. 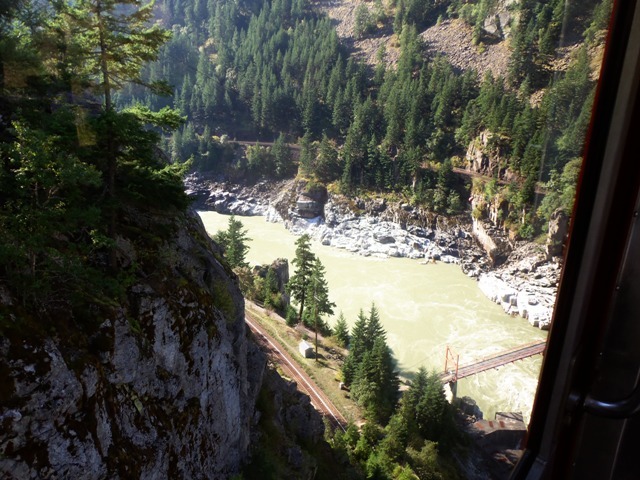 It was not until 1945 – thirty years later – that the Hell’s Gate Fishway, a series of ladders became operational and salmon started to flow again to the spawning grounds in the Interior. 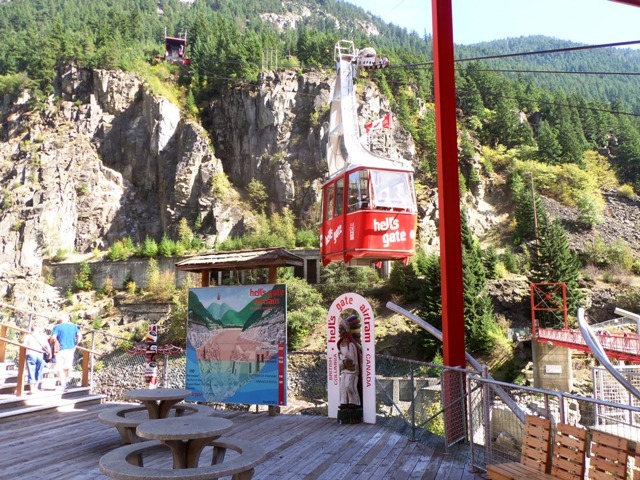 The amazing history of the Fraser Canyon, the river and Hell’s Gate is accessed by a ride on Airtram, a comfortable and thrilling facility that takes you across the swirling river. 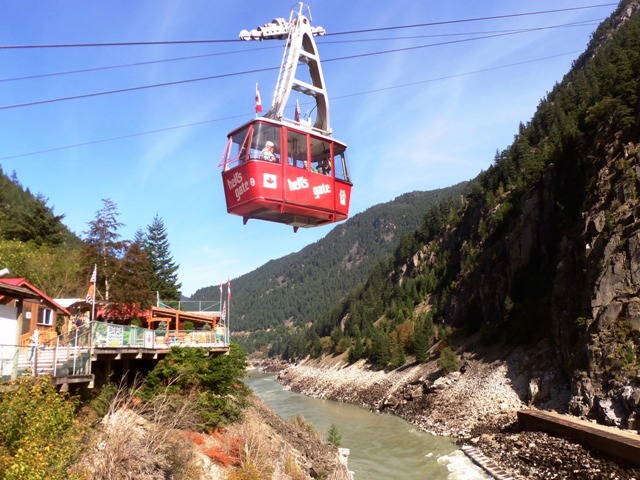 It’s here that you will capture breathtaking magnificent panoramas of the Fraser River as the Airtram takes you down to a showcase perched on a rocky plateau that overlooks the waterway. Created in 1971 it has grown over the years and now exhibits great historic photographs and information panels, a very informative Fisheries Display area along with videos that tell of the early explorers, the workers who built the roads and railways and of course the role of the salmon. There are also items from pioneer days. 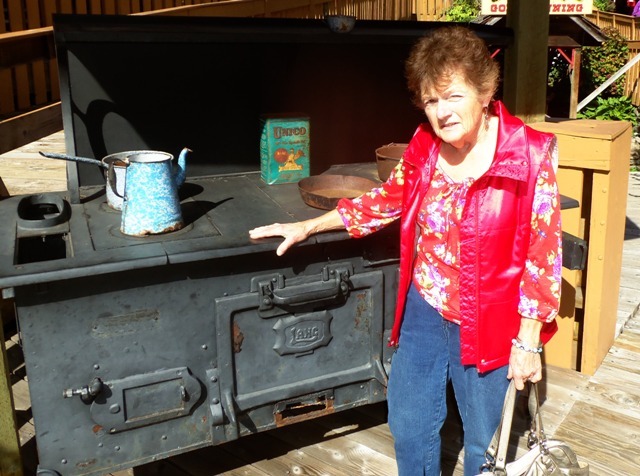 One is an ancient stove that mysteriously gets warm without a fire burning – they say it’s haunted. 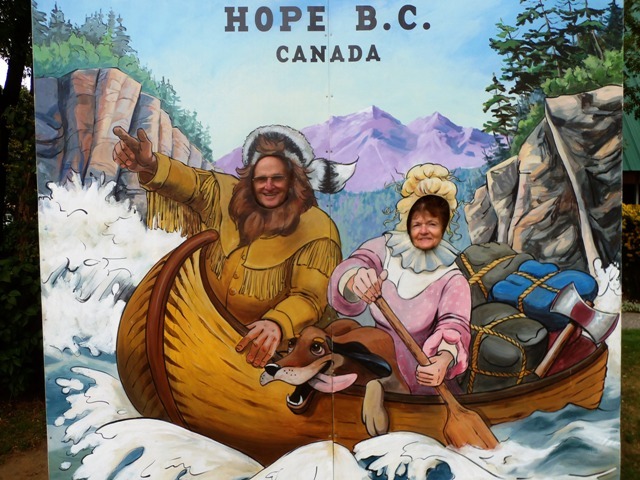 There’s also a tank where one can pan for real Fraser River gold, plus a spacious café, a tantalizing fudge factory and a well equipped gift shop. 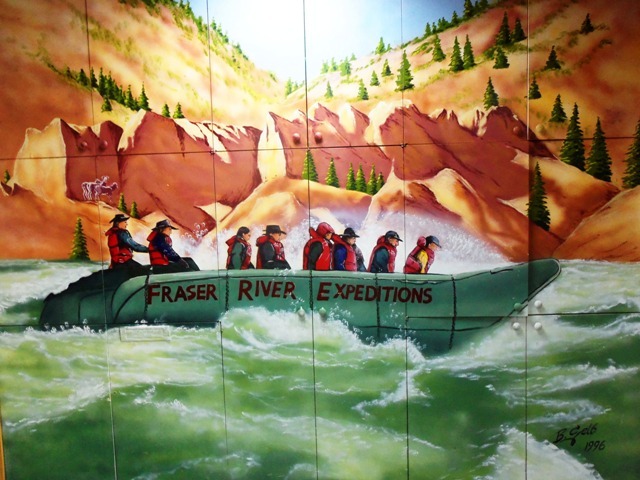 And if you wish to ride the waters of the great Fraser River you’ll see a display panel at Airtram with all the information, or you can book ahead and combine a visit to the Airtram and ride the mighty Fraser. The operators are Fraser River Raft Expeditions and the thrills start with the launch at Boston Bar. The powered raft presents many images and vistas of the Canyon that can only be witnessed at water level. It’s a one-day journey that sweeps down through Hell’s Gate and concludes at the historic and picturesque town of Yale. The link here is Raft Expeditions. 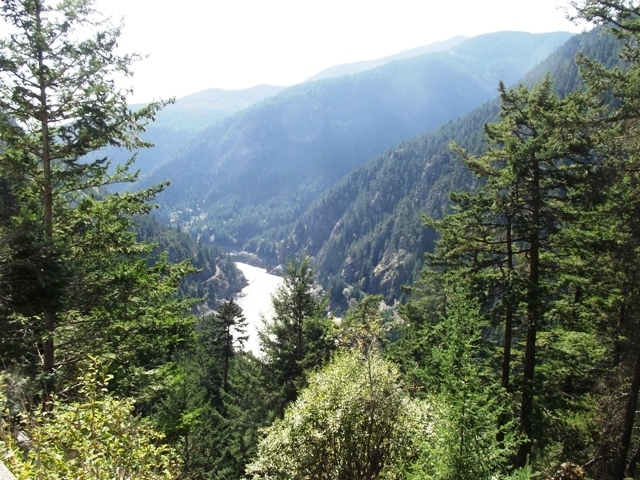 HOW I CAME TO WRITE THE NOVEL Even today, the Fraser Canyon is a delicate environment. 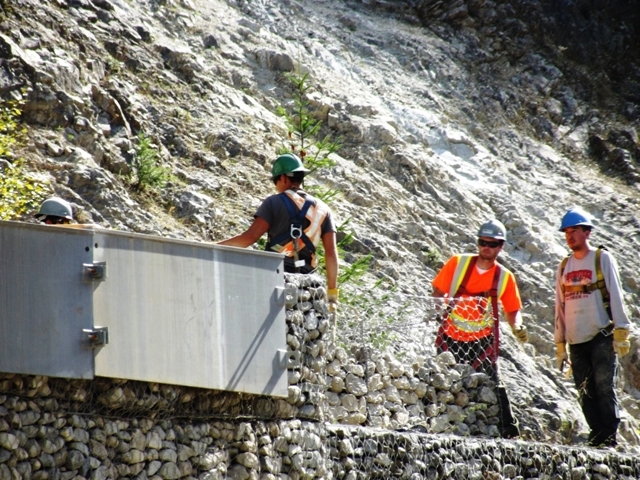 Sudden rockslides have occurred many times on the Canyon highway and many roadside cliffs and indeed mountain slopes are held in place by long steel bolts driven deep into the rock faces. You’ll see their caps as you drive along. One such mountain near Hell’s Gate is called Ferrabee. Back in the 1960s a highways design engineer warned that the mountain was unstable and might one day slip, slide and plunge into the Fraser River effectively cutting the highway and two national railroads and damning the mighty river. Well, the Highways Department crews regularly maintain a watch, in fact they were working there when we called by in October 2013. For various reasons the manuscript was deep sixed in a box for many years until 2011 when I hauled it out, rewrote sections and re-titled it: “CATACLYSM ‘79” The book is now historical fiction and tells the story of how an imaginary mountain named Vicar’s Peak that had stood tall for 50 million years, was toppled by a sharp, powerful earth tremor. 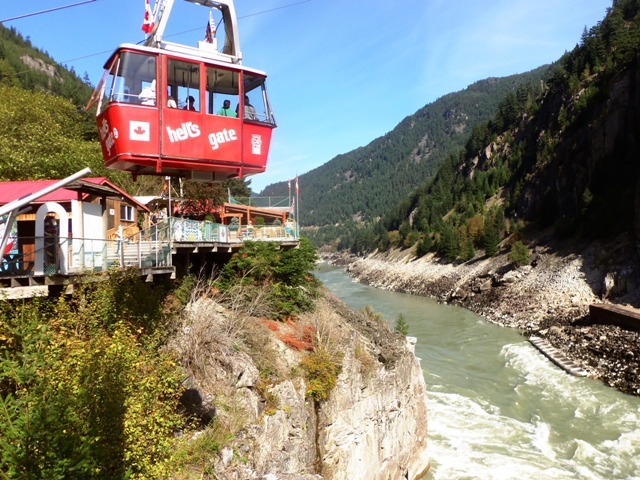 On July 1st – Canada Day – it crashes into the Fraser River near Hell’s Gate. It sets up a 400-foot-tall dam or blockage and the Fraser River running at two million gallons a second starts to rapidly back up. The prime physical victim is the new Wagonmaster Resort packed with vacationers. The luxury facility perched on a plateau close to the Fraser is owned by a less than straight Greek tycoon and supported by an egotistical and merciless politician. Needless to say the Resort was built contrary to all ecological protection laws. The hero of the story is Paul Rowan, former international correspondent recovering from injuries and now working as a travel writer. Rowan discovers a strange collection of people either staying at the Wagonmaster or working there. Wherever Rowan looks he finds people struggling with quirks, cultures and even perversions. Anxiety transcends everyone as they discover the fallen mountain has not only blocked the river, but the highway both north and south, plus the national railways. Rowan’s own life is thrown into upheaval when he discovers a former “soul mate” is now married to the bombastic manager of the Wagonmaster who takes Rowan for a helicopter ride over the Fraser and drops him onto a passing pontoon raft loaded with thrill-seekers about to ride the rapids through Hell’s Gate. The novel is actually an insight into the lives of various people including reporters living and working in the mixed cultures of the 1970s. While the novel came out of a Department of Highways engineer’s report that predicted catastrophe if the Fraser River became blocked, I discovered a strange and obvious irony: In spite of all talk about mass evacuation of a major city of several million people, there is no way the government or society can handle such a sudden exodus without substantial loss of life and the reasons are explored in my book. Incidentally, in the opening chapter – the Prologue -- the cataclysm has already happened. The saga covers the lives of various people – politicians, engineers, police, reporters, the affluent and the ordinary folk -- and how each one faces the challenges of survival that come up between the fall and the flood. The book is available at the Hell’s Gate Airtram Gift Shop and also at national bookshops and also at Amazon in both print and Kindle. Autographed copies are available at our web-bookshop CATACLYSM ‘79. If you email me the words "Airtram at Hell's Gate" and send me your name and your snail-mail address we will send you an autographed copy of the book CATACLYSM '79 FREE! And this includes media mailing. It is a total gift. Know that we do not keep your address. This offer is valid for the first 20 responders and finishes August 20th 2014 – whichever is sooner. The email address is robertegbyauthor@gmail.com. If you like or dislike the book and would like to write a 25 to 50 word review and send it to our page on Amazon we would be delighted, but there is no obligation to do this. The purpose is to get the book into circulation. Thanks. Now read on... It gets better. Pictures from our visit. Enjoy! and rises from a tiny glacial spring in the Canadian Rockies at Mount Robson. and it's a great place for pictures. Just about everywhere you look, there's a chance for a picture. 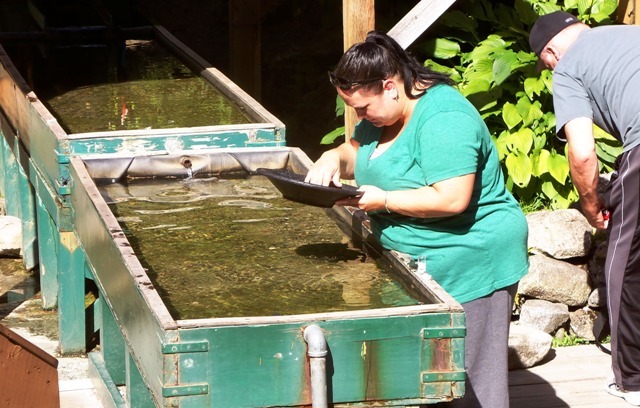 Fishways Project which was a joint effort between Canada and the United States. warm as if a fire is burning inside. It was strangely warm when we were there. holding up the bridge, there's a little white panel on it... what does it say? Next picture. that gave me the idea for Cataclysm '79. Raft Expeditions. 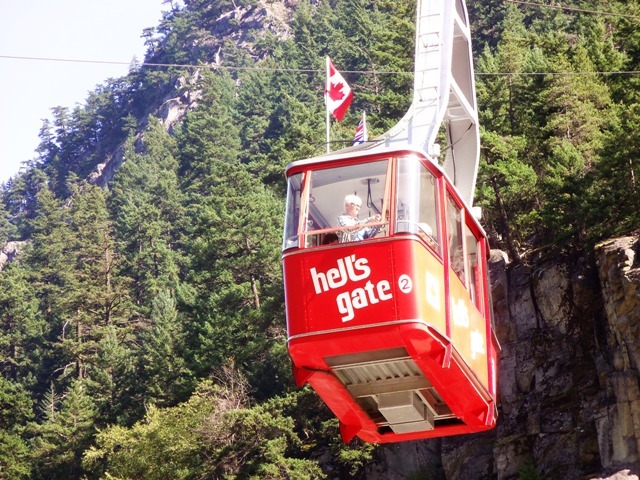 The picture, incidentally, is on display at Hell's Gate Airtram. just to experience the Airtram. The views even on a cloudy day are always breathtaking. at the raw beauty of the river, the canyon, the rugged mountains and the beautiful sky. 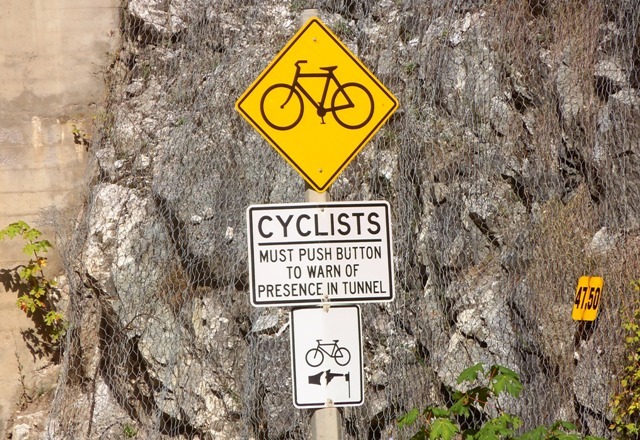 means the tunnel is open and safe for cyclists. How? drivers that cyclists are in the tunnel. Neat! Meet the famous Ferrabee Mountain. 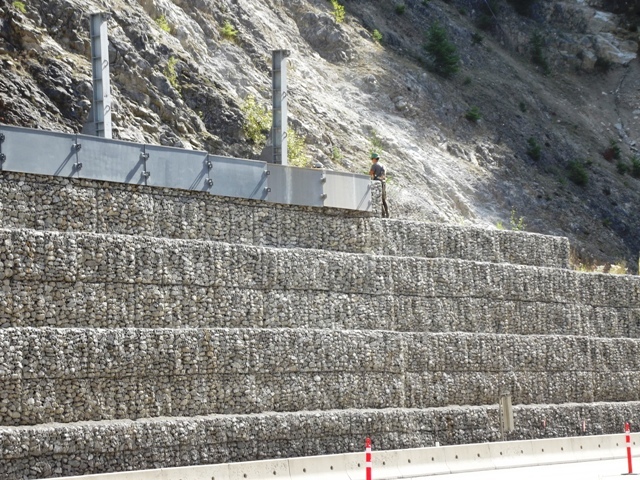 Once upon a time tons of rocks would fall and block the highway, so much so that a highways design engineer back in 1967 warned that the mountain could slide and block the Fraser River completely, triggering a disaster. the struture allowing one to see the massive size of the protective wall. traffic bellowed at us for stopping on the side to take this photograph. Yes, this is the town where in 1981 Rambo blew up the gas station. Great region for filming! British Columbia! Also thanks to Inge Wilson of the Destination Hope & Beyond Services for setting up the book reading. much in 50 million years, except the ones that occasionally slip. When you visit, take a camera and enjoy. 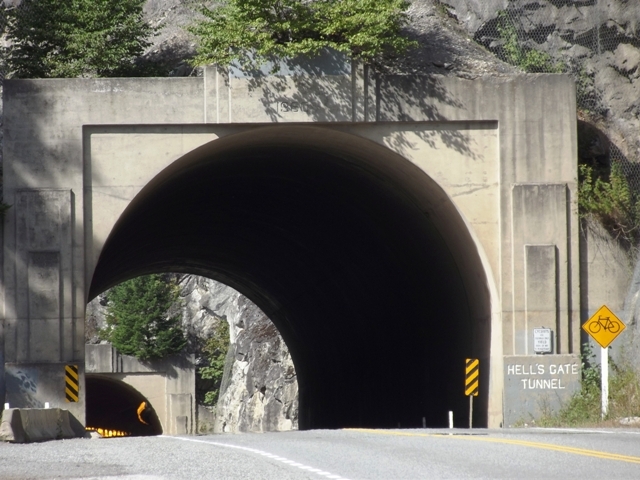 FRASER CANYON: From Cariboo Road to Super Highway by Lorraine Harris. 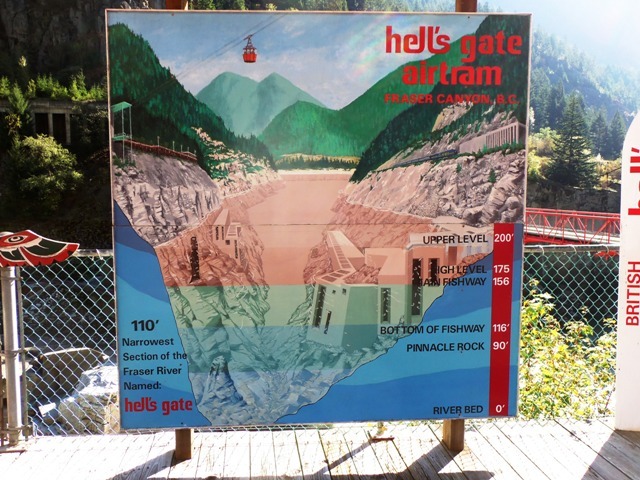 HELL'S GATE, FRASER CANYON: The story of Hell's Gate & the Construction of the International Fishways. Both these books contain great texts and photographs. That just about wrap's up this Special Feature. Don't forget to mail in for a completely FREE copy of my book Cataclysm '79 or you can buy one at the AIRTRAM Bookshop. See details above. Love, Light and Good Reading! Robert. Robert Egby, author of CATACLYSM '79: The Day the River Stopped. Visit our main Cataclysm '79 page.